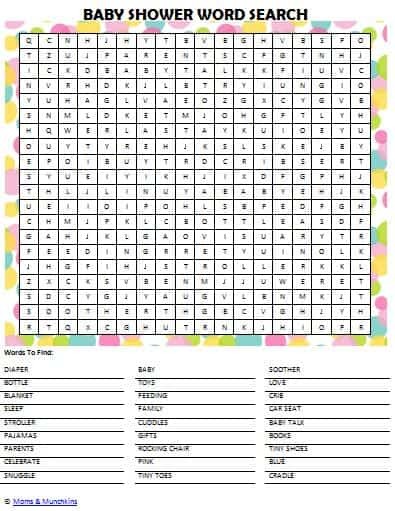 This baby shower word search is a great game to entertain party guests while waiting for all the guests to arrive. This free printable baby shower word search (click the picture above for the free printable) can be used as a game at the baby shower, laminated and used as placemats for decor or can be sent home with guests as part of the party favor. Guests can bring these home as a game for their kids to play. Games are a fun way to get guests interacting at a baby shower. Another fun baby shower game (and free printable) is the Baby Shower Scavenger Hunt. This free printable tests your knowledge of nursery rhymes and your clue solving skills. Baby Food Taste Test: Provide each guest with a set of plastic spoons and have them use their sense of smell (and taste if they choose) to guess the flavor of baby food from jars you’ve set out with the labels missing. Be sure to number the jars somehow so you & the guests can keep track of which one is which. My Water Broke: As guests arrive to the party, hand each of them a small plastic cup with a plastic baby in it frozen in ice. The first person to notice that their baby has broken out of the ice shouts “My water broke!” and wins a prize. Beau-coup and BabyShowerStuff.com both have a great selection of baby shower games, favors and gifts. They both have such a large selection that you’re sure to find the perfect accents for any type of baby shower theme. I hope your guests enjoy the free printable baby shower word search! Happy Planning! What has been your favorite game played at a baby shower? For unique baby shower favors and gifts, check out the adorable selection on Beau-coup (a Moms & Munchkins affiliate code). For more fun ideas to enjoy at a baby shower or at home with your family, follow us on on Facebook, Twitter, Pinterest and Bloglovin’. **Disclosure: I am part of the Beau-coup and Big Dot of Happiness affiliate programs. Any opinions expressed here are 100% my own. Digital paper design by Pixel Paper Prints.